Prosthetic hands have been 3D printed, regardless of age, to aid in everyday lifestyles of those who need it. While they won’t have quite as much function as a living arm, The Unlimbited Arm is both lightweight and functional to help with day to day activities for people missing a portion of their arm such as holding a glass of water to riding a bike. To print the hand we print each piece separately using the Fab Lab’s very own Makerbots and assemble the arm using fishing line as the tendons and padding for comfort with Velcro to complete the attachment. 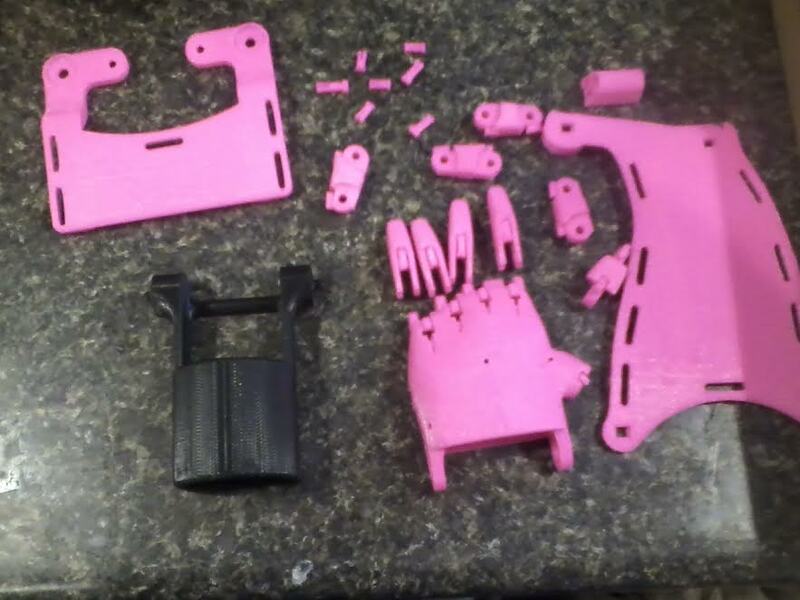 When printing hands, one would begin by taking the measurements of their arm that will be fitted with the 3D printed replacement in order to accurately fit the arm onto themselves and adjust comfortably. For this particular arm, I printed the suggested sizing values on one of our Makerbot printer using PLA with the color of my choice. In order to attach the tricep jig onto the tricep cuff, we boil the cuff and lay it on top of the tricep jig in order to fit it on as accurately as possible. Team Unlimbited has been developing and improving these arms for countless people in order to help give them function back for a low-cost but “handy” device. Seeing children receive these arms is incredible because they are given back something that most people take for granted, the simple function of a second arm. Everyday thousands of people around the world sustain injuries that require a cast or brace to stabilize their fracture/ sprain and promote healing. Traditionally these casts were made of fiberglass, which is fairly light weight, but can be very abrasive and called for a set of thick padding to protect the skin. Additionally Fiberglass casts are particularly troublesome when it comes to getting wet because any moisture trapped inside the padding can create chaffing for patients which can develop into bacterial infections. 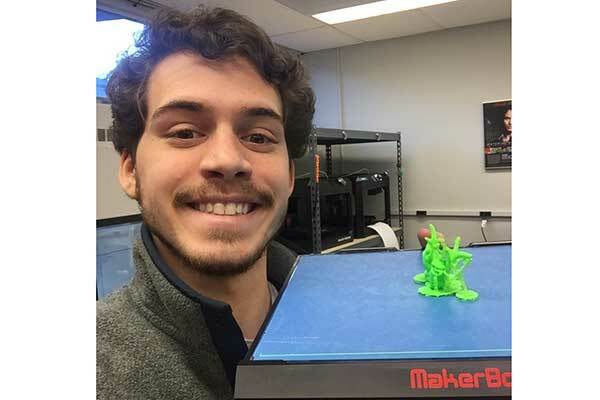 Recently through breakthroughs in 3-D printing applications groups of people have been coming together and creating designs for lightweight and cheap casts made from printed PLA material. Additive manufacturing by 3D printing and the medical field seem to be two highly compatible areas that could benefit each other. Sprains and fractures are injuries that are treated differently from person to person and incident to incident and CAD programs that allow for the scaling of printed parts can be implemented to tailor a brace to any individual. Here at UVM we printed a simple cast from one of our MakerBot printers that was worn by an employee with a sprained wrist. This cast was designed to be printed as a two dimensional net, that would then be heated using hot water to be contoured to the “patients” arm. This process may sound overly involved but was in fact simple to do and required water that was almost boiling and a container big enough to submerge the 7×7 print. First the part was submerged for a few seconds until it became highly malleable. Then it was quickly taken out and pressed on the wrist with pressure on all sides to lock in the desired shape. In the picture below this particular brace used Velcro straps to be secured onto the wrist. There are other processes being explored that involve using a 3-D scanner to record exact dimensions of a patient’s body so that cast can simply be snapped into place over their limb. The later process is desired if the area of injury is highly sensitive and cannot take any loads applied to it. 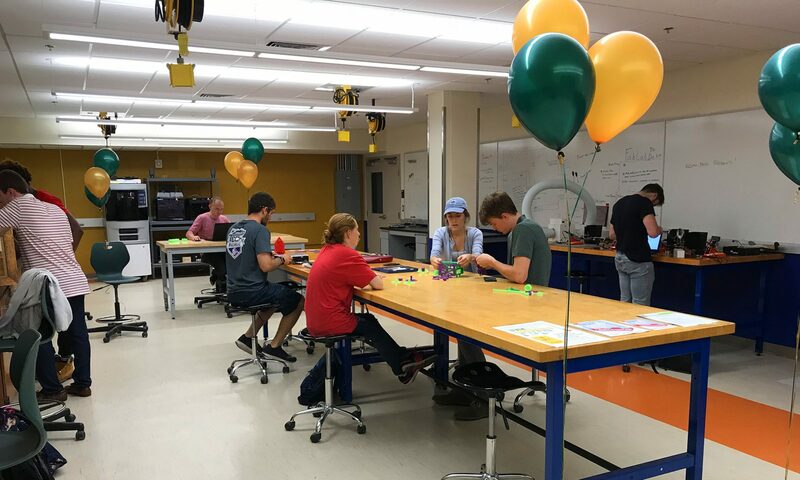 UVM is proudly kicking off Burlington’s first Innovation Week (October 17–20), an event showcasing the vibrant greater Burlington ecosystem of innovation, design, and technology. This event is sponsored by the Office of the Vice President for Research, the Entrepreneurial Forum. and BTV Ignite. in the UVM Recital Hall. 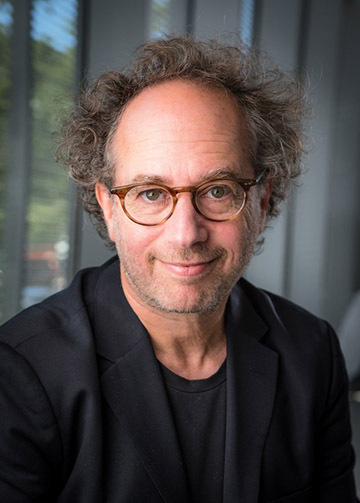 Tod Machover is co-founder of the MIT Media Lab, where he is the Muriel R. Cooper Professor of Music and Media and directs the Opera of the Future Group. He was named 2016 Composer of the Year by Musical America and is a recent finalist for the Pulitzer Prize. His Hyperinstruments have been played by virtuosi from Yo-Yo Ma to Prince. technology to stretch composition, performance, listening, and participation. Zeus, a combination 3D scanner, printer, copier and fax machine. Meet the FabLab’s newest guest, Zeus. (Professor Frolik is letting us borrow it). Zeus, produced by AIO Robotics, is a combination 3D scanner, printer, copier and fax machine. 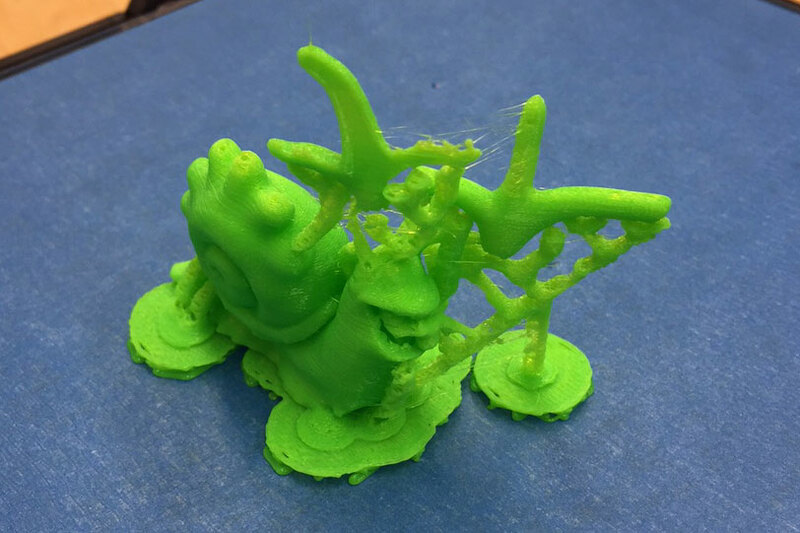 The print resolution is comparable (if a bit coarser) to that of our makerbots, but the real innovation of this machine is the integrated 3D scanner and powerful onboard software package. The scanner is a step up from our current 3D scanning setup, which requires a separate computer and a lot of user input to produce a decent model. AIO’s machine has a powerful user interface built on the open source operating system Ubuntu. This means that Zeus is not just a 3D printer, scanner, copier and fax machine, but also a stand alone computer that can be used to surf the web (if one is so inclined) and more importantly, perform all of the complex operations that involve meshing together a 3D scan. To take a scan with Zeus, all one needs to do is select the resolution of the scan, place an object in the machine and press start. The machine will automatically take pictures of the object from all angles and mesh them together into a 3D model which can be printed, exported to another computer, or faxed to another Zeus. One of the first copied objects. Low quality settings were used to speed up the process and the shiny metal of the lock was coated with poster paint marker to improve visibility for the scanner. Bamboo is an appealing material for many purposes and worldwide because it is reliable, inexpensive and grows rapidly in varied conditions. As a 2015 Barrett Scholar undergraduate Civil Engineering major Sara Dorr created unique molds using the FabLab’s 3d printers that mimic the internal patterns bamboo fiber. 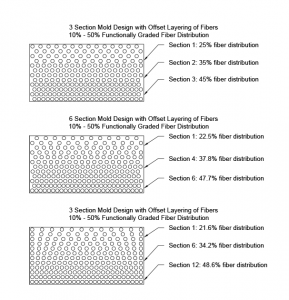 These molds provided opportunities to experiment with novel distributions of materials like carbon fiber. The potential outcome is newly engineered composites that can be used to optimize lightweight energy harvesting structures such as wind turbines. In bamboo there is a higher density of structural fibers near the stronger exterior surface; this density gradually decreases in fiber concentration moving inward and away from the exterior. This graded pattern is considered to be the critical contributor to bamboo’s remarkable strength in resisting lateral wind loads. As a Barrett Scholar Sara’s research was advised by Professor Ting Tan. Learn more about Professor Tan’s research. Diagrams by Sara Dorr. Photo of Sara by Cam C Ruffle-Deignan. Sara Dorr and the Stratysys Dimension 3d printer. Post submitted by Cam C Ruffle-Deignan. 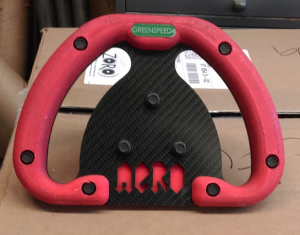 The Alternative Energy Racing Organization (AERO) uses the FabLab almost daily during the school year to prototype different parts on their alternative energy racing car, Greenspeed. The machine they use most is the laser cutter. The laser cutter allows them to create quick cardboard prototypes to ensure proper geometry and measurements for car parts that will later be machined. “The rapid prototyping tools of the FabLab make it easy for AERO to iterate and prototype quickly,” says team member Emmie Bolt. 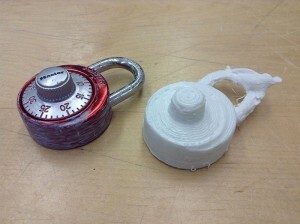 Access to the FabLab provides opportunities for the group to be creative and customize designs. Photographed here is the AERO car steering wheel, printed on the FabLab’s Stratysys Dimension 3d printer in 2013. Through multiple years of racing competitions it has held up extremely well and will hopefully steer the car to victory at this spring’s annual International Formula Hybrid Competition. Photos provided by Emmie Bolt and AERO.